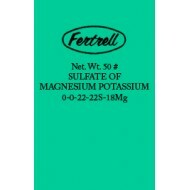 Sulfate of Potash helps Potassium deficient soils thrive with this mixture of potassium and sulfate. Typical analysis: 0-0-50-20S. Please check for availability before placing your order.